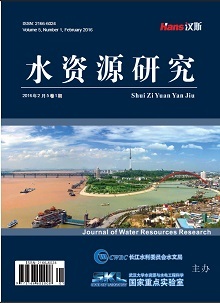 The paper introduced the research of the water environmental health risk assessment of Cu, Pb, Cd, Zn, Mn in Dayihe River in Shandong province based on the model for water environmental health risk analysis recommended by the United States Environment Protection Agency. The levels of risk about chemical carcinogen and non chemical carcinogen were calculated respectively. The health risk caused by drinking water and dermal contact was evaluated. The results show that the order of risk is Cd > Pb > Cu > Mn > Zn, and the total health risk for individual person per year caused by five heavy metals is higher than the maximum tolerable value of 5.0 × 10−5a−1 recommended by ICRP. In order to decrease the damage to human health and maintain the ecological balance and sustainable development of human beings, the water quality should be improved. 孙树青等. 湘江干流水环境健康风险评价[J]. 安全与环境学报, 2006, (2): 12-15. 宋春霞, 彭元成, 苏金铃. 火焰原子吸收分光光度法测大沂河水体的重金属含量[J]. 广东微量元素科学, 2006, (3): 46- 49. 刘凤, 李梅等. 拉萨河流域重金属污染及健康风险评价[J]. 环境化学, 2012, 31(5): 580-585. 孙树青, 胡国华, 王勇泽. 湘江干流水环境健康风险评价[J]. 安全与环境学报, 2006, 6(2): 12-15. USEPA/540/186060. Superfund public health evaluation manual. 杨仝锁, 郑西来, 徐延营等. 青岛市黄岛区饮用水源健康风险评价[J]. 安全与环境学报, 2008, 8(2): 83-86.